The fashion icon showed off her moves in an effort to speak out against the actions of the Cuadrilla oil and gas company. Today in Lancashire, England, Dame Vivienne Westwood got footloose for an important cause. 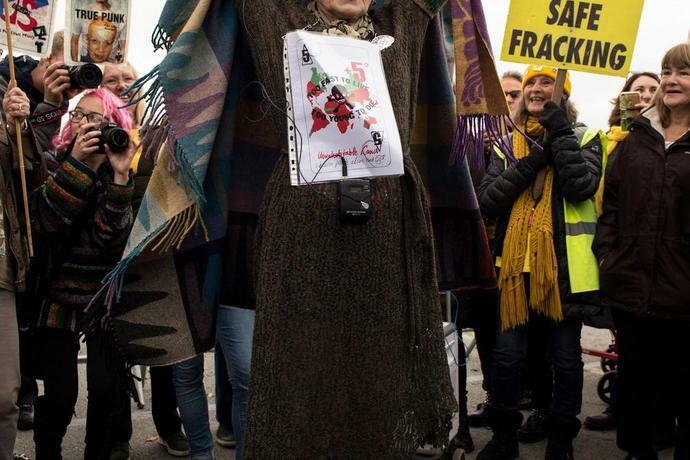 The designer and longtime activist participated in a protest against the fracking practices of Cuadrilla Resources, and instead of merely marching down the streets outside of the oil and gas company's site, she decided to start dancing. Wearing a cloak made of scarves, Westwood danced to ABBA's hit "Dancing Queen," the same song that British prime minister Theresa May poorly shimmied her way through a couple of weeks ago at the nation's Conservative Party conference. The polarizing leader was mocked in the Twittersphere and beyond. What better way for Westwood to throw shade than to perform her own version in the name of protecting the environment. Her protest dance party comes at an alarming time, considering that the U.N. just released a new climate report stating that a global crisis might hit as soon as the year 2040. Outside of igniting the punk movement, Westwood has always been a vehemently outspoken leader when it comes to standing up for just causes and for the health and safety of our world, and she is one of the few in her industry who has been unapologetically vocal about these political issues. We need her moves and her punk vibes now more than ever. Here's hoping that she keeps on dancing for a long, long time like the queen that she is.